Erwin is sentenced to death, but his gamble involving Pyxis and the other regiment commanders pays off. Levi's squad races to Eren's possible location. Keikaku-motherfucking-doori! Erwin's whole plan to overthrow the government was to expose how they would rather let half of humanity die than to allow them into the innermost part of the city. In front of all the military commanders, he was able to expose how the inner council was actually in charge, the King was a mere figurehead puppet, and that their rule violated the most important part of their charter in prioritizing humanity's preservation over personal gain. And he did it all by getting Pyxis' forces to declare a false breach by the Armored and Colossal Titan. He also got Nile to turn by planting in his head how his family might be harmed by the inner council not allowing evacuations into the interior spaces. I love it when a plan comes together! Pyxis said something very key to the junta in charge of the fake king. While those select few may know the mysteries of the Titans and the Walls, which has been made clear by now, the ignorant military is much better equipped and motivated to save human lives. 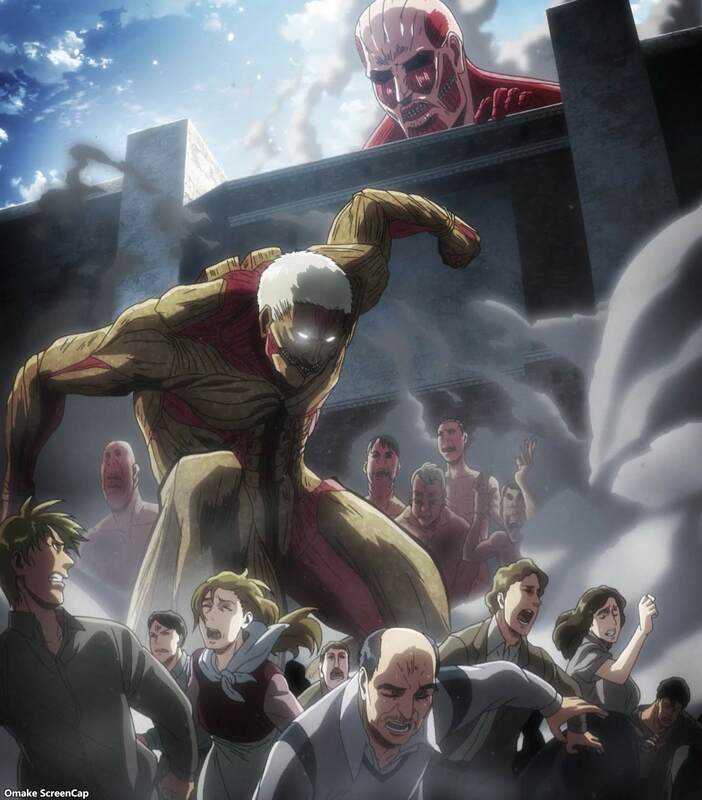 The inner council appears to only care about their secrets, so I'm pretty interested in why they had to install a false king, why Rod Reiss went along with the plan, and why this inner council is more afraid of the truth about the Titans and Walls getting out instead of random Titans killing the majority of their population. This junta may be selfish, corrupt, and power hungry, but there's got to be a motivation behind their initial actions. Well, the people monster part of this season is over, so now it's time to get back to the actual monsters. The royal Reiss family is intimately involved with the Titans and we'll finally get some more clues on how underneath that strange chapel. But first, we'll have to deal with that whole Ackermann family reunion. Fun! Erwin accused the inner council of making some deal to keep the Titans away. That seemed to work for a hundred years. Everything Pyxis said in his denial of Erwin was also an indictment of the conspiracy against Erwin. Pretty savvy. Erwin just smiled when he was given his death sentence. Keikakudoori! Here we go! Breached Wall! Evacuation operations! Hurry! Look! Titans in this anime about Titans finally showing up half way through the season. Or did they? The inner council just put a death sentence on half of their country. That Nile guy isn't going to like that. These dudes talk about Eren as the Power and a Vessel being prepared to take it. They mean they're going to make a Titan to eat Eren, right? Oh, hey. False alarm. Thanks for actually doing the thing you accused Erwin of doing. Civil War? Nah, brah. Coup d'état! This Premier Zachary was in on Pyxis' and Erwin's plan too. The Garrison soldiers rounded up the Interior Police, which they said was easy since most of them were somewhere else for some reason. Hmmmmmm, I wonder where. It looks like this fake king's only job was to keep his eyes open as he slept. He did this for 26 years? Alright, back to Levi. The action starts up again. Levi's not so happy about this coup. He's still got work to do. Hange has clues about a chapel on the Reiss lands. It apparently blew up on the day of the breach with the invading Titans with the entire Reiss family in it, except for Rod. Oh really. He came for Historia a few days afterward, which is when Kenny killed her mother. Did Reiss make a bunch of Titans from his family, which exploded the chapel? I hope we find out. Are they still alive as Titans running around somewhere? Armin asked a good question. If this Power transfer works how they think it does, that means Eren was a Titan at some point and ate some other Intelligent Titan to get that Power. Ah. Eren's chained up ready to get eaten. Uh oh. Historia looks like she's been turned by her father. Maybe, maybe not? Next time, is it time to find out what Eren's father was doing with Titans? And why was that scene of Frieda brushing her hair thrown in there at the end before Eren woke up? Big questions for a cliffhanger here.